Baby shower is an event to celebrate and welcome the newest member of the family. We give gifts to our friends or family members who are about to have a child. Having a baby is like receiving a wonderful gift from heaven. It is the most precious thing on earth that parents will ever have. Having a baby is a big responsibility but the most rewarding responsibility will ever have. Giving gifts to the soon to be parents of the new baby is extending your best wishes and congratulations to them. I prepared a list of wonderful gift ideas perfect for baby shower. These items are cute and practical gifts for baby girls. Check out these great gift items. What a sweet gift for a lovely little baby girl. 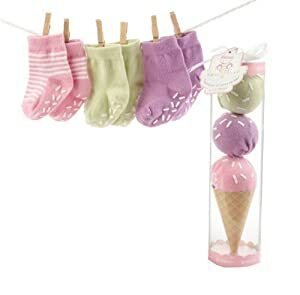 This gift idea is so deceiving, it looks like an ice cream but what is inside it are three pieces of cute little socks for baby girls. Each scoop of this ice cream it a pair of socks in strawberry, raspberry and lime flavor. They seem to have sprinkles on top of it but those are actually rubber traction that adds friction for your baby’s safety. It has a cute presentation that makes it extra special. The packaging is so adorable. Perfect gift for a baby girl. These cute little socks are so cute and fit well on cute little feet. 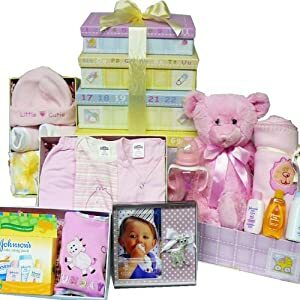 Giving gifts on baby shower is extending your best wishes and congratulations to the parents to be or new addition to their family. This gift is the cutest style of sending your best wishes to your friends or family member who is about to have the new baby. This gift is a set of adorable keepsake gift boxes stacked high with baby necessities inside it. After all the goodies are gone these decorative keepsake boxes can be used as storage of cute memories or containers for other baby stuff that your baby has. Each box is crafted with love and sealed with your best wishes. The boxes are stacked and ties with a bow on top for a wonderful presentation. This is perfect for gift giving. This will be her first ever baby doll. This is an adorable and loveable toy for your little angel. Babies love soft toys. Besides its adorable look and soft texture it is also a safe toy for little babies. It something they can cuddle when she is sleepy. This will be her snuggle buddy even when she is already a biggie. This is not only a cuddle toy but can also be as her security blanket. This gift idea is machine washable and definitely a sweet and lovely toy blanket to give a little baby girl. This lovely bunny toe slippers are made from 58% knitted cotton and 42% knitted polyester for its shell part and 100% knitted polyester lining. It is s cute gift for cute little baby girls. This pair of slippers is so soft that little baby girls will surely love. 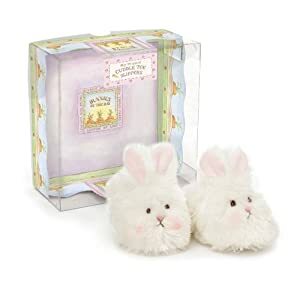 These soft faux slippers are absolutely a comfy that will keep her little feet warm. These cute slippers are machine washable and perfect for 3-6 month old baby girls. Both the baby and the parents will love this gift idea. Great choice of gift for little angels. Take a look at this nice 3D animal blanket. This is absolutely a gift idea that even parents will love. 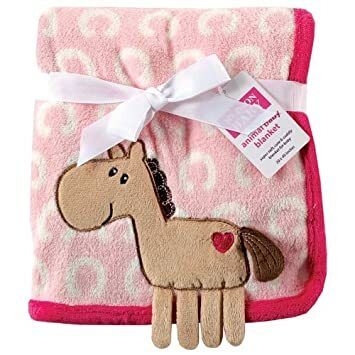 This baby shower gift is made from 100% polyester and has a 3D horse design. It will spark up baby’s mind. It can be used as a blanket, cuddle toy, stroller or car seat cover. It is so practical and so useful. This 3D animal blanket is machine washable and has good quality. It is fluffy and soft that babies will surely love. It is so comfortable to use. Babies will feel like they are cuddled using this soft blanket. You will not regret giving this adorable gift. This comes with a pretty gift ribbon, perfect for gift giving. These cute keepsakes and piggy bank is made with love. It is a hand painted ceramic gift that comes in a lovely gift box. 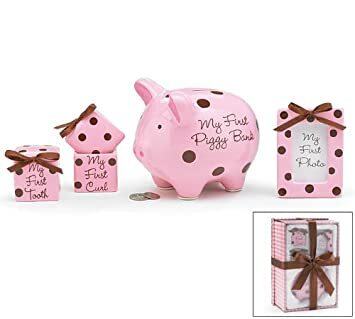 This gift set includes keepsake boxes for her first tooth and first curl, piggy bank and a photo frame. All of these cite items are made of ceramic. This is a beautiful gift idea for lovely baby girls. It is something the can keep their lovely memories when their baby girl is still small and fragile. This gift idea will be appreciated and loved. A gift of everything a baby girl needs. It is a 10 piece gift set that includes a crib quilt, crib bumper, fitted sheet, crib skirt, diaper stacker, window valances, toy bag, baby pillow, baby mittens, diaper bag with changing pad, and a bottle case. Made from 100% cotton and fits almost all cribs. It is an awesome gift with good quality and style. Best baby shower gift you can give to your friends and family member that soon be having their little baby girl. This gift idea is a personal choice. It reminds me of my little daughter who always says that’s he is a princess. I think almost all little girls wanted to be a little princess, and for me they are truly a princess. Treat your little baby girls as precious as diamonds. They are your little princesses. This bodysuit is made from 100% cotton with soft texture. 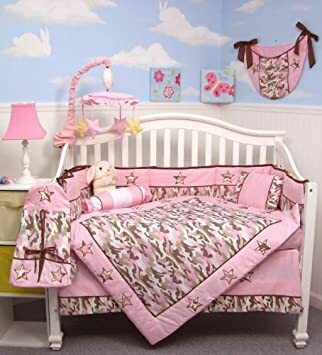 It has cute pink color perfect for baby girls. It is nice to see genius babies. This gift idea helps develop baby’s brain. Perfect for all ages, from ages 0 and up. Mozart magical cube has five large buttons that corresponds to different sides of the cube that plays different instrument such as harp, flute, French horn, piano and violin. It also has an orchestra button that plays all six instruments at the same time creating an entertaining music. This toy will keep your future musician busy and entertained. Lovely gift idea. Personalized gifts are special gifts for your friends and family member. Baby shower is a special celebrating welcoming a new addition to yours or friend’s family. This gift idea is something that will be remembered and valued. This long sleeve shirt will keep your little angel warm all the time. This is a practical and useful gift for new parents or expecting parent. They will love this gift idea. It is made from 100% cotton that offers a comfortable and warm fit for little baby girls. What makes this gift special is it can be customized. Add photos or funny graphics or phrase to be printed on this shirt. This shirt has an adorable design that will be loved by the parents. This will truly be a compliment magnet. Baby girls are as special as baby boys. They look fragile at first but they will become someone who are special and can speak their minds. Babies are special gifts from heaven that we need to value and take care of.